On Dec 2, 1952 notice appeared in the New York Times of the death of Nicholas Mihas, age 58. Mihas was identified as the former owner of the Penn View Hotel at 320 West 34th St. In 1952 Mihas lived at 313 8th Ave., Asbury Park, New Jersey. Searching for other information on Mihas I found a World War II draft registration in 1942 when he lived at 414 W. 36th St. His business was a hat cleaning and shoe repair shop at 451 9th Ave. (near 35th St.), and he gave his birth date as 17 May 1894 at St. John, Greece. The Penn View Hotel seems to have opened as Penn View Furnished Rooms around 1920. Directory listings of the time gave the name Nicholas Hess as either proprietor or manager. Nicholas Hess (1878-1966) was listed on the ship manifest of the SS Chicago, sailing from Le Havre to New York 12 Nov. 1910. He was accompanied by his wife, Isabelle Hess, age 23, their nationalities were given as Luxemburg, and "Non Immigrant Alien" was stamped on the line with their names. In 1918 Hess registered for the World War I draft as born 11 March 1878, Luxemburg, Alien. He gave his occupation as "Furnished Room Housekeeper Nicholas Hess 231, 239, 241, 251 W 34." These addresses were a block east of 320-22 W. 34th St. and on the other side of the street. This same Nicholas Hess petitioned for naturalization 25 Nov. 1918 while living at 251 W. 34th St. In the U. S. Census of 1920 Nicholas Hess lived at the Olive Tree Inn located at 338 E. 23rd St., and gave his occupation as "waiter, restaurant." At this time he was living alone. Then in 1922 he applied for a passport to travel to Europe accompanied by his wife, Theresa Hess, born Germany. The application is inscribed "To be held at this office until presentation of marriage certificate & divorce [decree]." It would seem, then, that Hess divorced Isabelle and remarried ca. 1920. Nicholas and Theresa Hess appeared on the ship manifest of the SS George Washington sailing from Bremen 13 Dec. 1922. Their address was 241 W. 34th St. Nicholas was 44 years old and Theresa 35. The couple appeared in the U. S. Census of 1930, living at 43-07 55th St., Queens, ages 52 and 42. They had 2 young children, ages 6 and 5. Theresa gave her age at the time of her first marriage as 34. Nicholas' occupation was "carpet salesman," but he continued as either manager or owner of the Penn View Hotel until 1941/42. In the 1940 U. S. Census the Hess family continued to live at 43-07 55th St., Queens, and Nicholas Hess's occupation was "hotel proprietor." Shortly after (in 1941/42) he moved to the Elk Hotel on 42nd St. where he remained until 1956. For more on the Elk Hotel see the entry at 360 W. 42nd St.
A photograph by the Brown Brothers dated 1925 shows this stretch of 34th St. when the Penn View Rooms sign consisted of a small overhang sign above the front door. At that time the building facade (similar to a standard brownstone) was very different from the 1986 building. But the dormer windows on the top floor were the same. The 1986 sign could not have been painted prior to the demolition of the property to its immediate west. The 1925 photo shows a building tight against it in this position. Probably the building plans filed 1932 and 1933 for 324-328 W. 34th St. mark the earliest date for this sign. The Brown Bros. 1925 photo can be viewed on the New York Public Library's digital collections. Another photograph, undated but probably 1940s, by the Wurts Brothers (active ca. 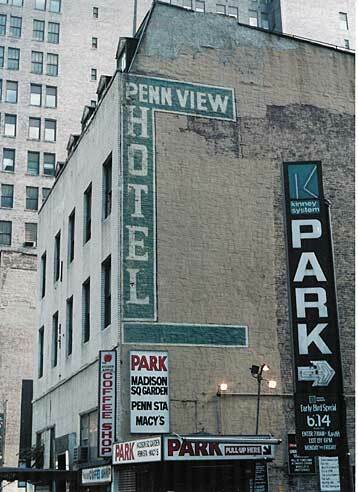 1880s-1960s) shows the Penn View Hotel after alteration of the facade, with properties cleared on both sides of the building, and the sign in my 1986 view painted on the east wall. This image shows a restaurant called the Little New Yorker Cafe in the position of the coffee shop (called The Golden Apple) on the ground floor. The restaurant went by the name of Little New Yorker Cafe from 1942 to 1954. This photo can also be viewed on the New York Public Library's digital collections. The Penn View was in business on 34th St. for some sixty-five years and closed around the time this photo was taken: mid-1980s. The U. S. Census of 1930 listed 49 occupants of the hotel. Occupations indicate relatively modest means, including laborers, plumbers, cigar makers, dressmakers, a show musician, a bricklayer and a dance teacher. This ad ran in the Times during the 1939 World's Fair. Ten years later the hotel was advertised For Sale. In 1952 the rate was $10.50 a week. In 1975 they were under new management. On 3 Jan. 1990 the New York Times noted the demise of this building: "The Penn View Hotel at 320 West 34th Street, between Eighth and Ninth Avenues, was finally bulldozed out of existence yesterday to clear land for a 26-story office building... The Penn View had been without tenants for several years."